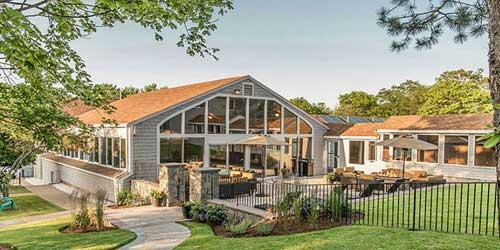 Massachusetts hotels, inns, and resorts recognize the important role of a family dog, and several offer pet friendly hospitality, even including services like dog beds, on-staff dog walkers, dog treats, and convenient maps of local walking trails. Call ahead to these Massachusetts dog friendly hotels, because some lodgings request a refundable cleaning deposit and place limits on the size of visiting pets. You and your favorite pet can explore this great city together while settling into this landmark hotel. Two dogs of any size are permitted per guest room. You’ll be greeted with a complimentary glass of champagne and your pet will receive a gourmet dog biscuit with his or her name on it and each pet will receive their own dog bed and bowls Upon request, the concierge will walk your dog while you’re out and your pet can join you for dinner and snacks in the CLINK dining area. The hotel is conveniently located near a small park and set across from the Charles River Esplanade where you can walk, run, and bike along the water. Guests traveling with pets should call ahead to verify availability at the time of booking. 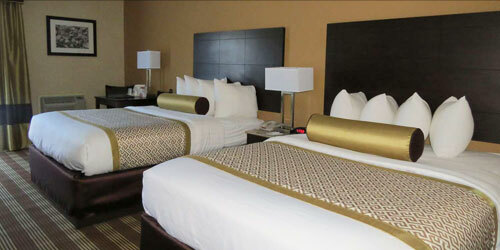 If you love to travel with your favorite pet, the Sheraton Commander is the place for you. The Cambridge hotel welcomes dogs weighing up to 80 pounds. Your faithful companion will be able to join you as you stroll the recreational walkways along the Charles River or step out our door into Harvard Square for some people watching. 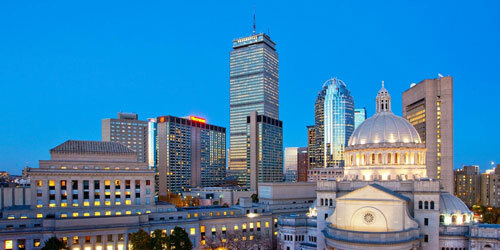 We offer easy access to downtown Boston, too. Our freshly-renovated guest rooms are filled with sunshine by day and each features the renowned Sheraton Sweet SleeperTM bed. 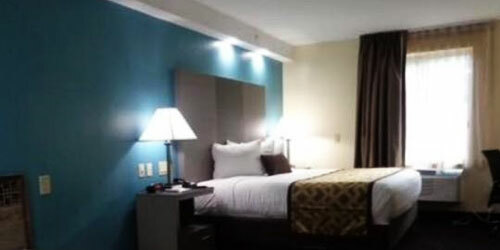 Rooms are also equipped with flat-panel LCD televisions and free high-speed Internet access. Dine at our restaurant, Nubar, an establishment with a 100-year history in Harvard Square. We cook with garden-fresh herbs and vegetables grown right outside our kitchen door. Your favorite pet is welcome here. Great cities and great hotels are even more fun to enjoy when they can be shared with your favorite pet. 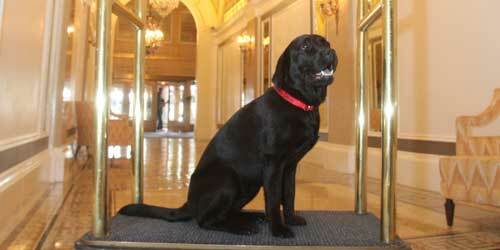 Fairmont Copley Plaza understands this and has made all rooms pet friendly. You’re welcome to bring along up to two pets of any size for an additional fee of $25 per pet, per night. The places to walk, run, play and relax are unlimited in Boston and environs, and after a day out, you have this magnificent hotel to return to together. You’re in the center of everything in historic Back Bay, near Beacon Hill and the Freedom Trail, cafes and great shopping at the Copley Place Mall, the Shops at the Prudential and the boutiques of Newbury Street. Why would you travel to the Berkshires and not bring your canine companion? Think of all those mountain trails to hike, small-town streets to explore and fresh air to revel in? 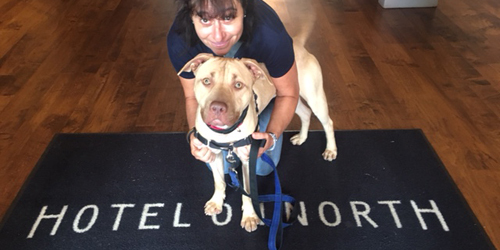 And, luckily, there is a hotel all ready to welcome you and your pet: Hotel on North, a 45-room boutique hotel with spacious rooms that are perfect for both two- and four-footed guests. Is Fido hankering for a doggie treat? The hotel staff has them. Need a crate to comfort Rover while you two humans enjoy a romantic dinner at townie-favorite Eat at North? Ask hotel housekeeping: They have them. You and your dog will have the time of your lives. 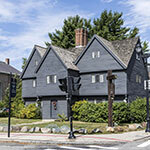 Rockport is made for families and pets and so is this very pet friendly hotel on Cape Ann. At $30 per day per pet, you get the great amenities and comforts of a full service hotel and the friendliness of people who know a thing or two about families and pets. Bring your favorite four legged friend to this beautiful village by the sea and walk downtown together to great shops, restaurants, historic landmarks and Motif #1. Run free on magnificent beaches, smell the salt air, and take in those majestic ocean views. You’ll also enjoy the indoor pool, exercise room and Jacuzzi. Your room includes a 32” high-definition TV, coffeemaker, microwave, and mini-fridge or share a larger suite and get even more bang for your bark. Click here to view our pet policy (PDF). Bring your special friend for a special Red Lion Inn getaway. 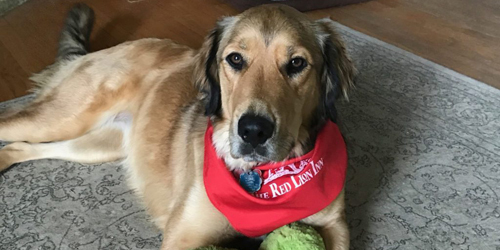 If their people friendly hospitality is not enough, the Red Lion Inn welcomes your favorite, well-trained and quiet pet, too. Pets are accepted on a limited basis with prior reservation and a $40 fee per pet, per night. Upon arrival, your dog or cat will receive a welcome treat and you’ll stay together in selected first floor guestrooms and suites. Enjoy the Inn amenities, great food, a fitness room, heated outdoor pool and hot tub, a great big porch with rocking chairs, and nightly entertainment at the Lion’s Den. Head out for long walks and runs, and visit the many parks, trails and open spaces that abound. And be sure to introduce your pet to the Red Lion Inn’s resident lobby cat. From your dog’s point of view, what’s not to love about the Berkshires? 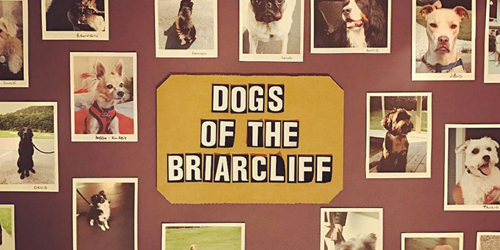 Fresh air, hiking trails to explore, mountains to climb with their owners: And, if those owners are smart enough to book one of two dog-friendly rooms at Briarcliff, there’s also a comfortable place from which to launch those Berkshire adventures. Briarcliff, a sensibly priced, contemporary bed and breakfast between the walkable villages of Great Barrington and Stockbridge, sits on six acres of grounds and unspoiled woodland. The trail to hike Monument Mountain starts right across from the inn. And, speaking of what is close, so is your parking space: You and your furry friend only need to walk 10 feet from the car to your door. Voted "Best Mid-Cape B&B/Inn" for 10 years by Cape Cod Life (2008-2016 & 2018), the Lamb and Lion Inn features unique amenities including wood-burning fireplaces, suites with kitchens, a courtyard with solar-heated salt water pool, a year-round hot tub and fire pit, complimentary use of beach chairs, towels and umbrellas, a full-service yoga and spa studio and a unique "eat anytime and anywhere" breakfast. Whether your first time to Cape Cod or your 50th, you will love the inn's complimentary self-guided driving tours, which help guests find the Cape's hottest hot spots and most tucked-away treasures. Voted "One of the top 12 pet friendly properties in the world" by CNN. 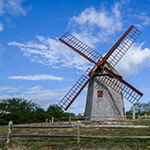 Pets need a little Cape Cod too! The Best Western Cape Cod Hotel welcomes pets and provides a delightful mix of historic charm and modern features that make your stay in Cape Cod the perfect getaway. From a healthy morning buffet to free high-speed meeting rooms, we provide a comfortable and convenient atmosphere for our diverse clientele. Enjoy a swim in our indoor heated pool, relax in our sauna, work out in our fitness center, or lounge with friends on our private sun deck. When you're ready for a day or night on the town, we're just five minutes from the quaint shops and exciting activities of downtown Hyannis. Enjoy free long-term parking in Hyannis as long as you are a guest of the hotel. While you’re traveling to Boston, share the special experience of this boutique lodging luxury with your favorite four-legged canine friend. Dogs of any size are welcome for no additional fee, though the hotel suggests a $25 donation be given toward the local animal shelter. The hotel offers a limited number of dog friendly rooms with dog walking services and treats available upon your request. Now imagine one of the greatest cities of the world to spend the day with your special friend enjoying some of the great outdoor spaces in any city - and even some indoors that allow dogs too. Your accommodations are perfect from classic or studio rooms to suites with canopy beds and fireplaces, surround sound satellite radio, rainforest showers, and comfy bathrobes. Woof. Confirm room availability at booking. 1st on Conde Nast's list of 10 Top Hotels in Boston: Readers Choice Awards 2018. Stay in the heart of Pilgrim country at this affordable lodging near all the attractions and places to walk your favorite friend. For a one-time $25 charge, you and your pet can hang out together for a night, weekend or longer vacation in one of America’s most historic destinations. 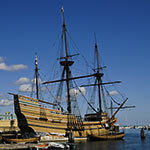 On Route 3 in Kingston, you’re near Plymouth Rock, the Mayflower II, Plimoth Plantation and the Pilgrim Hall Museum as well as Duxbury Beach Park, Plymouth Bay Winery, and Brewster Gardens. You’ll enjoy non smoking rooms with a microwave and mini-refrigerator, and flat-screen HDTV, There’s also free WiFi and the Baymont Breakfast Corner, a 24-hour fitness center, and a micro-mart for stocking up on everyday essentials. Children under 17 stay free. 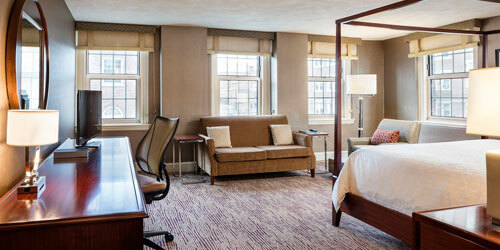 The Taj Boston, in the heart of the city, is out to win the heart of your pet. Ranked as one of Boston’s top pet-friendly hotels, the Taj offers everything from clean, comfy dog beds to “Bark Boxes” full of treats for four-footed guests. Plus, don’t be surprised if staff members soon know your pet’s name – or present him with a tasty tidbit on the way out the door. And dogs will definitely want to head out the door: The spacious Boston Common is but a walk across the street and through the Public Garden. Although leashed dogs are always welcome, the Common also features off-leash areas where your dog can stretch those legs and make new friends. 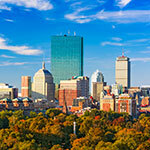 Why leave your furry friend at home when you visit Boston? 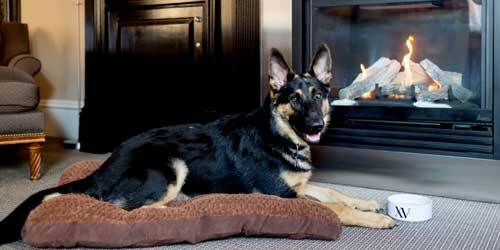 The Sheraton Boston Hotel welcomes pets weighing up to 40 pounds. 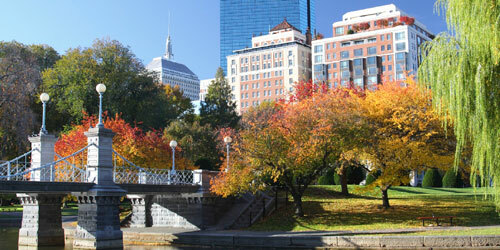 Boston is a walkers' city, and you'll love exploring our streets and parks with your faithful companion by your side. Each of our guest rooms features a 37" flat-screen TV, an ergonomic workspace, high-speed internet access, and our renowned Sheraton Sweet Sleeper® Beds. We also offer one of New England's largest indoor pools, with a retractable ceiling to allow guests to soak up summer sunshine. Our state-of-the-art fitness center is equipped with weight machines, free weights, and low-impact exercise equipment. Enjoy the sauna after your workout. For breakfast visit our Cafe Apropos; for diner or cocktails, try our Sidebar & Grille. 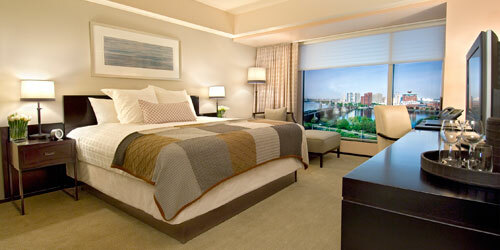 Fido is welcome at the Westin Boston Waterfront, an award-winning hotel located beside the city's seaport. And if he enjoys being pampered, he'll love it. 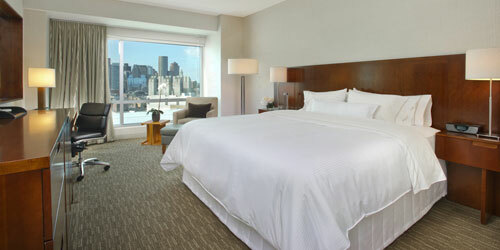 Our rooms offer great views of the city and are equipped with the Westin Heavenly Bed® for a restful night's sleep. Re-invigorate your body with a workout in our fitness studio. We can provide you with New Balance running shoes or workout gear to use during your stay. Swim a few laps in our indoor heated pool. Afterwards, relax in the whirlpool. For breakfast or lunch, try Sauciety, our modern American grill. MJ O'Connors is our Irish pub; seafood dishes include butter poached lobster and steamed mussels in curry sauce. Enjoy a hand-crafted martini at our City-Bar-Boston Harbor. What’s a vacation without the family’s four-footed friend? 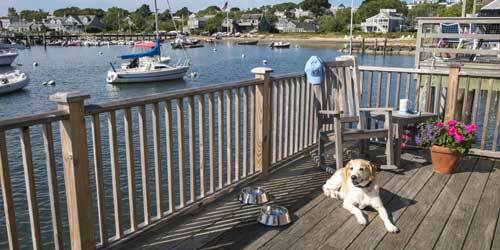 At Nantucket Island Resorts, Fido is far from forgotten. Just book a stay at Woof Cottages, one- and two-bedroom seaside residences where your dog will feel as welcome as you. Woof Cottages have all the amenities of the resort’s standard cottages, plus a few more, including doggie beds, food and water bowls, a welcome bag with a nautical chew toy and doggie treats, a pet turndown service and personalized pet tags. And if your schedule gets busy (and it might, with all the island activities available outside your door), dog-walking is at your service. Coming in by boat? Don’t forget to stop by the Boat Basin office for a special pet gift. Humans and dogs looking to vacation together have found the right place. 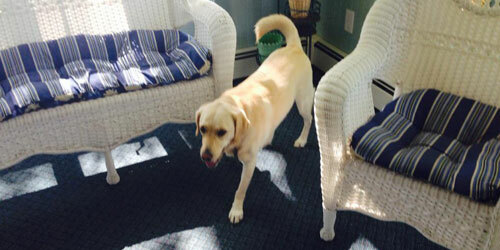 This Cape Cod friendly lodging and accommodations is very pet friendly and located on in a quiet residential area with acres of scenic, open space just right for walks, running, playing ball and dozing under a tree. And all this is set on a beautiful salt water cove. This waterfront getaway features a variety of amenities and outdoor activities including a private boating beach with ramp and dock, free rowboat and paddleboat use, a heated outdoor pool and barbecue grills. Each waterfront guest room offers one queen and one double bed, a private bath with tub and shower, cable TV, in-room coffee, microwave, and refrigerator, and, free high-speed Internet. 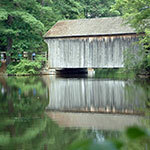 Located just an hour’s drive from Boston and Providence. What better way to explore Boston, the walker's city, than with your dog trotting by your side? It's no problem if you stay at the Hilton Boston Logan Airport hotel, because pets are always welcome. You can spend the night in one of our comfortable rooms with your dog curled up on the rug beside you. And there's so much more to love about our hotel. We've got great restaurants, and room service, too. Enjoy breakfast at Berkshire, grab a Starbucks coffee and a snack at Cafe Presto, and for dinner stop at Connolly's Publik House, where the menu includes lobster rolls and stone-baked pizza. Take a swim in our 40-foot pool, or work out in our fitness center, equipped with Pre-cor cardio machines.